We specialise in the tobacco vending sector. Our range of vending machines include solutions for retail, tobacconists, convenience stores, catering, hospitality, supermarkets, etc. 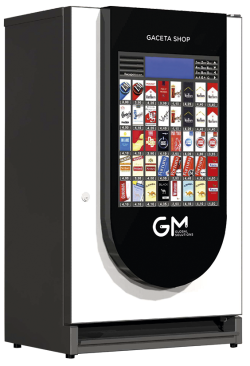 Discover our range of indoor and outdoor, attended and unattended, cigarette vending machines. In this section you’ll find our range of self-service vending machines, whereby users make their purchase with no need for the presence of a salesperson. Discover our very latest LC range, a range that is compact, innovative and functional. Its slimline design and compact dimensions make it ideal for any business establishment. An affordable range, for our most demanding customers. The dependability of a well-established range. Right from the outset, the Crystal range has been designed to offer a high level of performance. 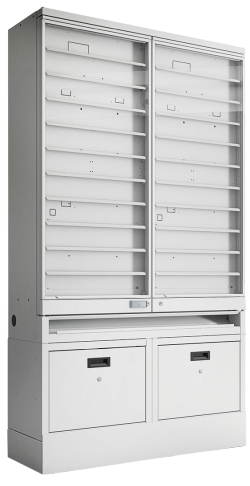 Its outstanding features include space optimisation, different configuration options and a wide range of channels (from 10 to 39) and capacities (from 350 to 1200 packets). The most technologically advanced range by GM Global Solutions, featuring a cutting-edge design, Raspberry Pi processor and product selection touch screen. Thanks to its advanced technology combined with enhanced user experience, the AVANT is the most efficient solution available on the market. 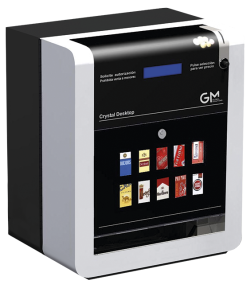 The Crystal Desktop is a high capacity, yet compact cigarette vending machine that is ideally suited to any business establishment, either anchored to the wall or placed on the counter. 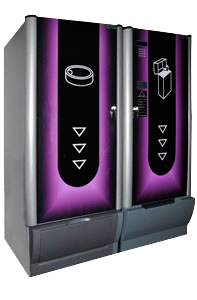 The automatic dispenser designed for the sale of cigarettes outside the business establishment: intuitive, functional and technologically advanced. The smart storage system for tobacconists. An automated cigarette dispensing solution, offering security, control, high capacity, speed, time saving and management, and a modern, up-to-date image of the business establishment. The most technologically advanced solution for the over-the-counter sale of cigarettes in convenience stores. A system that is set to increase your sales. The cigarette machine designed for press kiosks and convenience stores. Offering you the possibility of an advertising screen and a revamped, technological image for your business establishment. A new concept for the retail sector, combining payment at the checkout with a sale through one of the automatic machines in any of our ranges, for enhanced stock control and security.